Bowerbirds and catbirds make up the family Ptilonorhynchidae. All are small to medium in size. Although their distribution is centered around the tropical northern part of Australia-New Guinea, some species extend into the central Australian desert and the cold mountainous regions of southeast Australia. Note that the Gray Catbird (Dumetella carolinensis) and Black Catbird (Melanoptila glabrirostris) from the Americas and the Abyssinian Catbird (Parophasma galinieri) from Africa are unrelated birds that belong to different families. The most notable characteristic of bowerbirds is the extraordinarily complex behaviour of males, which is to build a bower to attract mates. Depending on the species, the bower ranges from a circle of cleared earth with a small pile of twigs in the center to a complex and highly decorated structure of sticks and leaves — usually shaped like a walkway, a small hut or a maypole — into and around which the male places a variety of objects he has collected. These objects — usually strikingly colored — may include hundreds of shells, leaves, flowers, feathers, stones, berries, and even discarded plastic items or pieces of glass. The bird spends hours carefully sorting and arranging his collection, with each object in a specific place; if an object is moved while the bowerbird is away he will put it back in its place. No two bowers are the same, and the collection of objects reflects the personal taste of each bird and its ability to procure unusual and rare items (going as far as stealing them from neighboring bowers). At mating time, the female will go from bower to bower, watching as the male owner conducts an often elaborate mating ritual and inspecting the quality of the bower. Many females end up selecting the same male, and many underperforming males are left without mates. In a striking example of what is known as the "transfer effect," bowerbird species that build the most elaborate bowers are dull in color and show little variation between male and female, whereas in bowerbird species with less elaborate bowers the males have bright plumage. Presumably, evolution has "transferred" the reproductive benefits of bright male plumage (common among polygamous birds) to elaborate bowers, allowing males to display their fitness by means other than physical characteristics that would appear to attract predation. This complex mating behaviour, with highly valued types and colors decorations that in many species vary in attractiveness from year to year like fashion trends, has led some researchers to regard the bowerbirds as the most advanced of any species of bird. It also provides some of the most compelling evidence that the extended phenotype of a species can play a role in sexual selection and indeed act as a powerful mechanism to shape its evolution, as seems to be the case for humans. In addition, many species of bowerbird are superb vocal mimics. 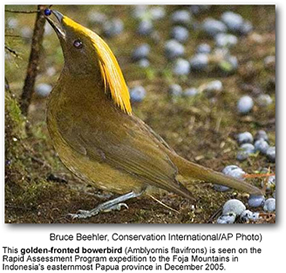 Macgregor's bowerbird, for example, has been observed imitating pigs, waterfalls, and human chatter. Though bowerbirds have traditionally been regarded as closely related to the birds of paradise, recent DNA-DNA hybridisation studies suggest that while both families are part of the great corvid radiation that took place in or near Australia-New Guinea, the bowerbirds are more distant from the birds of paradise than was once thought. Sibley's DNA-DNA hybridization studies placed them close to the lyrebirds; however, anatomical evidence appears to contradict this placement and the true relationship remains unclear. Sanford's Bowerbird, Archboldia sanfordi The Sanford's Bowerbird is a black bowerbird with a reddish-brown iris, grey feet and black bill. The male has a golden crest extending from forehead, blackish wing and long tail. Both sexes are alike. The female is smaller with blue-grey feet and without crown feathering. A polygamous species, the Sanford's Bowerbird inhabits to eastern highlands of Papua New Guinea. The diet consists mainly of fruits. This bowerbird was discovered by Ernest Thomas Gilliard in 1950 at Mount Hagen, Papua New Guinea. Some authorities considered the Sanford's Bowerbird as a subspecies of the Archbold's Bowerbird. Genus Sericulus: The genus Sericulus Swainson, 1825 of family Ptilonorhynchidae consist of three spectaculary colored bowerbirds. All three species built an "avenue-type" bower and are distributed in New Guinea and Australia. Spotted Bowerbird, Chlamydera maculata : The Spotted Bowerbird is a bowerbird widely distributed across inland Queensland and New South Wales in Australia.